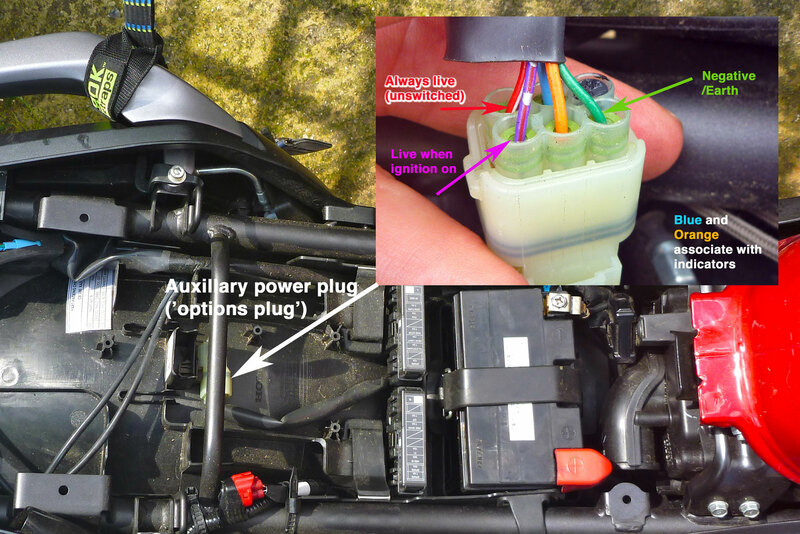 Normally I’d plug a 12-volt power plug for GPS etc direct to the battery via a fuse – not ideal but it’s less of a faff than finding a place to take power that’s switched via the ignition (usually off the always-on lights). 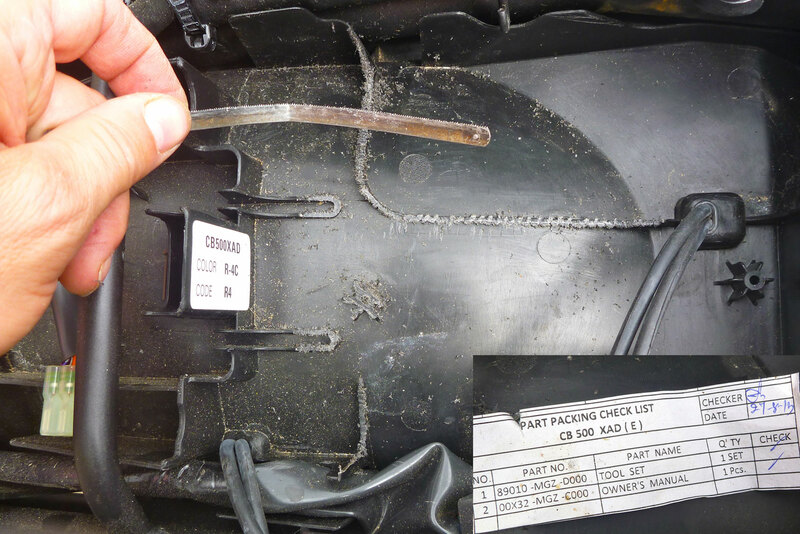 But on the CB-X forum someone unearthed a stray ‘options plug’ under the seat (left) that does just that and so is ideal for electrical accessories. 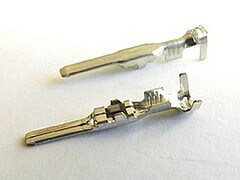 It even comes with an unwired wiring block clipped to it that’s ready for spade terminals. In the UK it’s a 6-wire block but with only 5 wires (inset left). Trial, error and much discussion on the forum divined which wires do what. Short version: purple is switched live and green is negative. These are the two you want to wire up stuff that will only work with the ignition on. 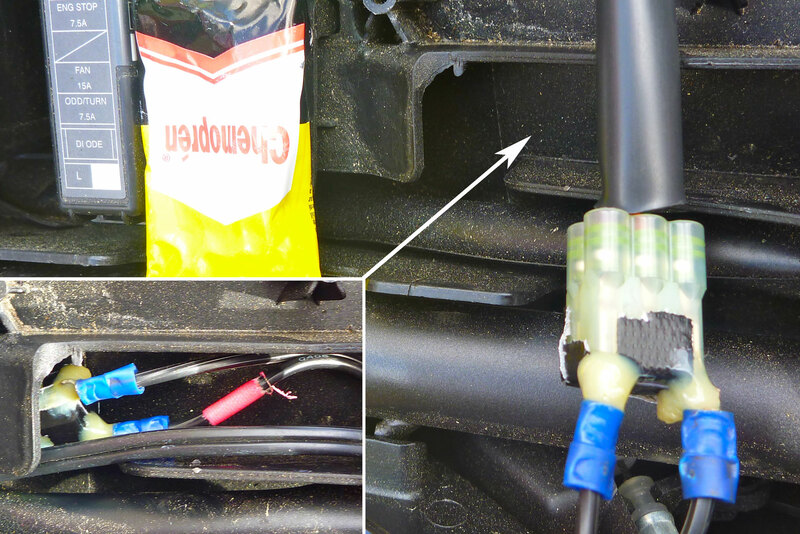 I thought about tracking down the exact correct terminals (right), slipping them into the unwired block with the seals and wiring it up, but realised it would be as simple if less neat to simply shove two wired spades directly into the live block’s end and ditch the unwired block. It all wants to be waterproof of course, so I carefully taped over the block and dabbed rubber solution where the chopped down spade connectors went in. I then repositioned the block in a plastic channel alongside (above left) and hopefully out of the way of any back-wheel spray. And while I was in the area, with a hacksaw blade I trimmed off bits of sticky-out plastic molded into the mudguard (right) to make more room for underseat tools and stuff. Getting the wire to the ignition key area for the 12v PTO socket was easy too: just two hex bolts removed the black LHS side panel and the wire feeds through over the radiator. It would have been neat to set the PTO into a hole in the dash below the speedo but I’m told there’s not much room behind there and finding out for sure would require protracted disassembly. Life’s too short for that so a secure slot was zip-tied next to the ignition key (above left). Still awake? 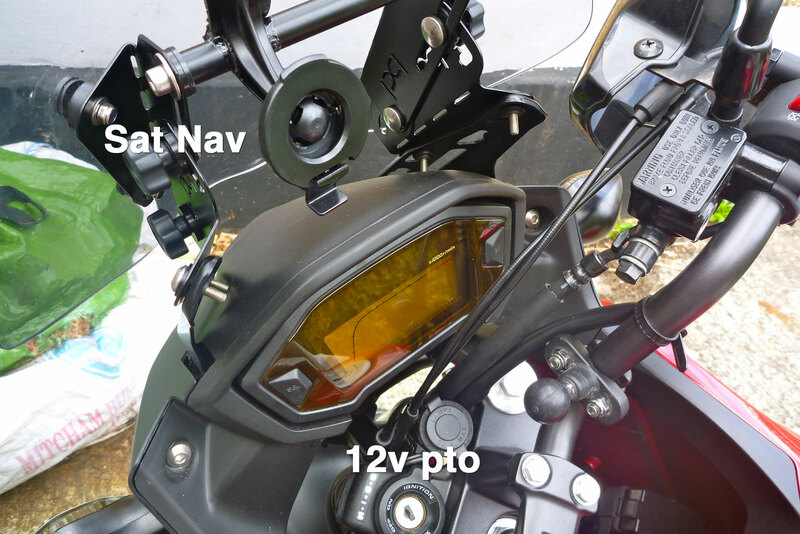 From bike to bike I’ve been running my Nuvi satnav on a RAM mount off the mirror stalk, but it’s a cumbersome combination of hardwear, better suited to a camera. My Palmer screen mount came with a half-inch accessory bar for that very purpose. I wanted something tucked in close to the bar to avoid leverage and wobbling, and the only idea I came up with was taking apart a spare Nuvi sucker mount, cut it down a bit then drill a half-inch hole through the neck and glue it onto the accessory bar. The irresistible lure of bodging. Looking forward to a long, 700-mile ride to the other end of the country this weekend. A chance to test out the screen, assess the seat which I think may not be so good, and get a feel for the bike in readiness for Morocco and beyond this winter. 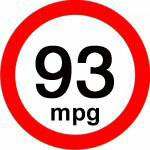 Latest mpg is 93 and that was trying a little, so I reckon 100mpg might take some doing. Plus this is off the odo though unlike the speedo (7-8% over) is actually only 3% over. Had this same odd discrepancy with the CRF; you assume they’re linked. Anyway, more like a true 90. 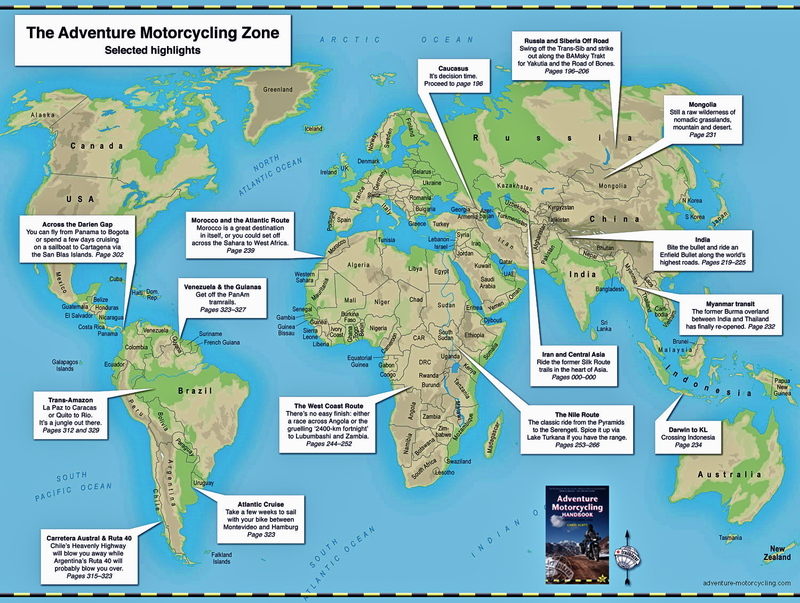 This entry was posted in Adventure Motorcycling Gear Reviews, Project Bikes, Project: Honda CB500X Rally Raid. Bookmark the permalink. This is extremely useful. I’m already getting started.